The time for a new era has arrived! Behind its peaceful facade, the garden of 75 Gnom' Street is actually the site of a power struggle between several gangs of garden gnomes living there. The Goal: Steal your rival's loot. 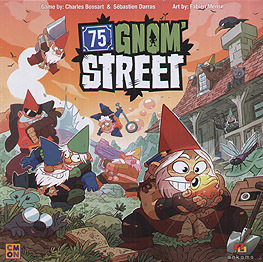 Choose your side and prepare to fight, because only one gang will remain at 75 Gnom' Street! Lead your gang, interrogate rival Gnomes, and guess where your opponents have hidden their loot!